Home » Blog» How to Do Keyword Research for SEO? Are you planning a campaign to promote your products and services? Well, you cannot do so unless you know the phrases that you need to target to promote your brand. For this, you need to research keywords for your marketing campaign. Keyword Research is a strategy to identify the actual search terms that your potential customers enter into search engines while looking for the information. What is your approach to keyword research? Oh! Are you not aware of the SEO keyword research process yet? Well, here is the step by step guide to keyword research that can help you through the process of keyword research and selection. Read on.. Think of what your business is all about, and come up with the topics that might prove useful to your business. Think from the customers’ viewpoint, and make a list of topics that, according to you, will be searched by your target audience. Usually, these are the topics that take place in most of the sales conversations. Now that you have the topics that you need to focus on, you are now supposed to identify the keywords that your target customers search for while looking for those topics. Yes! Analyze and come up with the terms that you think your potential customer searches. You must come up with the keywords that you consider important to rank in the search engine results pages. Remember, you don’t need to come up with the final list of phrases at this moment. Just collect a bunch of phrases that you find relevant from users’ point of view. We will make a selection from the list later in the process. For now, just look for the phrases randomly. Another way with which you can acquire keyword ideas is Google Analytics. It’s a tool using which you can get to know the keywords, which people used to reach your website. Are you not able to think of more keywords that people might use to land on a specific topic? Well, type any keyword in Google and see the related search terms that appear. At the bottom of the Google page, you will also notice that Google provides some suggestions for the searches related to the keyword entered by you. This will give you an idea of some other keywords which you can take into account. Want more keywords? Well, just type in one of those related search terms and you will get a list of related search terms of those related search terms. Isn’t this an interesting way to come up with all the possible keywords? Yes! It is! So, follow this step and fill out those lists of keywords. Do you know the difference between both the terms? No? Let’s get it clear! Head terms are the shorter terms that are used more commonly. You can think of it as one to three words in length. On the other hand, the keyword phrases with more than 3 words signify long tail keywords. Now that you know what these terms denote, let’s see how they are useful in keyword research. Are you interested in long term goals only? Well, you must take into account the short-term wins as well. You must look for the strategy that is a blend of both long term goals and short term wins. So, make sure you go for a mix of head terms and long tail terms. This is because people search head terms more frequently, which, thus, becomes difficult to rank. Alternatively, the long tail terms can be ranked easily! Yes! Even though you might find the most search volume in case of head terms, but a long tail term is usually more desirable in terms of traffic. Wondering, why so? Well, the user who enters a long tail keyword is probably the most qualified researcher for your brand. At the end, all you want is the growth of your business and people searching for the short terms might have several reasons unrelated to your business. On the other hand, the users looking for long tail keywords are the one having an interest in your products and services. So, make sure to mix head terms and long tail keywords. Did you like the way your competitor is ranking their keywords? They might be following a great strategy! However, you are not supposed to follow them while implementing your strategy. Yes! A keyword important to your competitor might not be that important for your business. However, you can evaluate your list of keywords by analyzing the keywords that your competitors are trying to rank for. Is your competitor ranking on the keywords that are available on your list too? That means you must work upon those keywords to improve their ranking. What about the terms that your competitors do not take into account? Well, it’s an opportunity for you to make the most of those keywords to grow your business. READ ALSO: How to Improve Website Ranking in Google? Another thing that you must take into account is realizing the balance of competitive terms and the ones that are more realistic. This will help you maintain a balance similar to the mix of head terms and long-tail terms. Follow the step and come up with the list of keywords that help you grow towards more stimulating SEO goals. Now is the time to cut down your list to some more relevant data. You can do so by using the keyword tool, which we call as Keyword Planner. The tool will let you know the search volumes and traffic estimates for the keywords that you are focusing on. Use the tool to flag those terms that provide very little search volume. These terms will not assist you in maintaining a proper mix that we discussed above. Are you deleting the particular keyword from the list? Wait! Check out their trend history in Google Trends, and delete them only if you find those keywords nowhere in the Google Trends. Well, that was the last step! Just follow the steps and see how efficiently you will acquire a list of keywords that will assist you in coming up with the right topics for the growth of your business. In case you want to go for professional services, ‘Mamsys’ can help you find your keywords with a proper focus on different pages of your website. 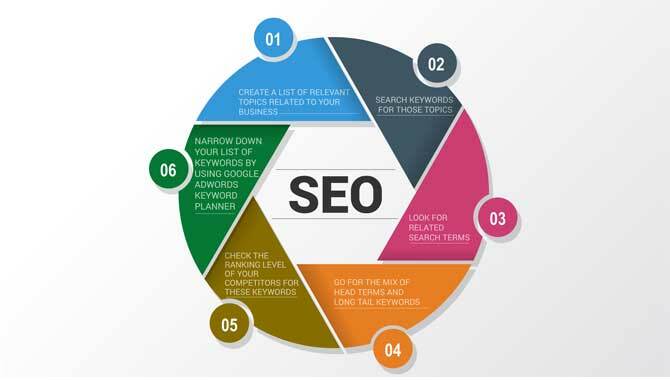 Experts at Mamsys will evaluate your keywords on a regular basis, which will help you maintain your presence among all your prospective customers.